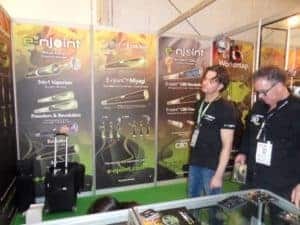 One of the products we have encountered with and actually tested and ended buying at Spannabis 2017 was the E-njoint Vaporizer. we were looking for a quicker and cleaner way to enjoy our stay in beautiful Barcelona and in the show (if you know what i mean). Like every Keyboard warrior that the only thing he inhales is the dust on his laptop screen we were looking for a non smoker/ roller solution to enjoy this wonder we call Sister Mary Jane. out of all the booth we were shop browsing one stood out for its fun and most convincing sales person, Kenneth V., who took the time to give us a long and very captivating pitch. he convinced us! mile to make sure we understand the benefits and the different states of the gizmo (there was a quiz at the end). Kenneth made sure to show us how to Vape safely and effectively for different forms of Marijuana- Weed, wax and the unspeakable&disgusting Oil , which filter goes where and how the hell do I operate this thing (“1,2,3,4,5!!!! pufffff minus 2 ff- dont drag it too much man”). I know he did it for the show and laughs but it helped when we tried it the first time. the effects- nice and mild buzz after a puff or two, nothing too dramatic. 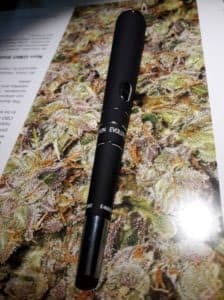 The good– clean smoke, No ceremony, easy to use (after a long pitch),long lasting battery time and cool gadget to keep around and show to stoner friends, good for travelers that dont need to carry all their smoking kit. 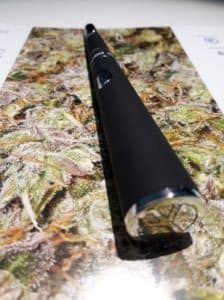 The not that good– Small amount each time you vape, enough for 1 good puff and 2 smaller ones (i assume the bigger E-njoint vaporizer solves this issue) , needs practice to get the hang of it. Cool to have on future Edition – A red light showing when it is time to start puffing (at some point i just guessed and was wrong). Score- 8 for the product, 9.5 for Kenneth the sales man who convinced us to make the purchase . The following tips and articles are solely recommendations and suggestions provided by us or our partners!